not to brag, but the weather here in lawrence is pretty fantastic right now. i’m talking 70 degrees & sunny. today i wore a short-sleeved jersey dress & a hoodie & was too warm. we’ve had the doors open all day, & jared took ramona out for a run & didn’t even put shoes on her (she was in the jogging stroller the whole time). this is the lady skater by kitschy coo. this is the pattern i was kind of trying to hack over the summer when i combined the renfrew with a big 4 knit dress skirt piece, but to be honest…the lady skater turned out 10,000 times better. i really need to tweak the fit of the renfrew, ie, figure out how to do an FBA on a knit pattern with no darts. my hacks turned out okay (i’m wearing one right now), but the lady skater was a lot more straightforward & i prefer the fit. the instructions give pretty detailed info on how to choose a size. it‘s based on high bust & high waist measurements. that put me in two different sizes, bigger in the waist than at the bust, so i graded between them & the whole thing came together with no problems. i cut the sleeves to match the bust size, & they might be just a hair small. like, there’s no way i’d be able to push up my sleeves. but that could also be due to the fabric, which is very thick & stable sweatshirt fleece. here’s the story on the fabric: jared went to boston to do research for his dissertation over the summer. his parents took ramona one week to show her off to all their friends at the regional quaker conference, which gave jared & i a chance to hang out baby-free in boston. one day while he was at the archives, i struck out for south boston to check out grey’s. i had heard good things about it in the blogosphere, but it didn’t exist when i lived there (nor did i sew back then). well, guess what? it wasn’t. i mean, maybe if i had not been so stressed about getting there, it would have been fine, but getting there was terrible & all i could think is that i was going to have to run that gauntlet in reverse to get back to the T. i had to stop at the nearest dunkin’ donuts & eat two boston creams to fortify myself for the journey. i felt like i should buy something, anything, to justify the trip, even though none of the fabric was speaking to me. i specifically wanted some kind of knit because i had just gotten my serger & wanted to practice with it. so i saw this gray sweatshirt fleece with pink flowers on it & was like, “…good enough, i guess?” even though i am not a florals person, & the gray was a bit too heather-y for me (as opposed to charcoal). 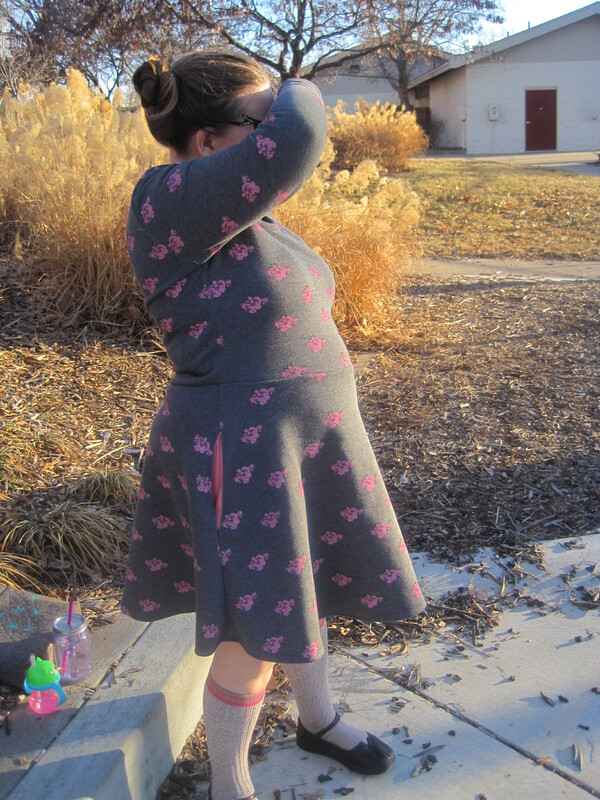 i had been planning to do another renfrew dress hack with it, but after making two, plus a couple of disappointing big 4 knit dresses, i just ran out of steam & the fabric sat in my WIP box for months. & then 2015 came along, & i was feeling so overwhelmed trying to remember all the different projects i wanted to sew that i just wasn’t sewing anything. (plus, pneumonia.) finally, last week, i sat down & made an exhaustive list of everything i want to sew right now. i came up with 49 items. um…that‘s A LOT, considering that i consider myself very productive if i churn out an average of four or five projects per month. that‘s enough to keep me busy for the rest of the year! & one of my ideas was to make a lady skater from that long-neglected floral sweatshirt fleece. when i pulled the fabric out of the bin, i was pleasantly surprised to find that it wasn’t as heather-y as i remembered. it‘s still a little light for my tastes, but it‘s fine. i decided to just dive in without making a muslin. i cut it all out & proceeded to the part where you fold over the cuffs & neckband & press them. that‘s when i discovered that this incredibly soft fabric must have some poly in it, because i melted one of the cuffs. oops. i cut out a new cuff (the dress only required about two yards of fabric) & moved on. my serger was giving me some grief, & eventually i figured out it was probably because i didn’t have the tensions set properly for such a thick knit. i mostly constructed it using a zig zag stitch on my regular machine, with a stretch needle. the instructions for installing the neckband make no sense. it says to fold the neckband in half & pin the halfway point to the middle of the front bodice & stretch to fit. which means half the neckband is supposed to cover half the front & the entire back, & the other half covers half the front? no. i just stretched & pinned to fit on my own & it was fine. no rippling or warping. i did add side seam pockets because a dress without pockets is useless to me. so, that‘s that! i’ve worn it twice so far, but ramona peed on it & it had to go in the hamper. i will definitely make this again. i love the fit, the length, the ease of construction. i’m excited to make short-sleeved versions for summer. man, this post turned out way long. sorry. That dress is awesome! I’m not usually a fan of sweatshirt dresses, but this one has some really nice structure to it. I would totally wear it. i’m not usually a fan of sweatshirt dresses either. but this is really nice material & it’s really cozy & soft. i think i’m going to use the leftover fabric ti make sleeves for a sweatshirt moto jacket (since my hoodie is starting to fall apart). i feel like there must be an easier way to get to grey’s, but their website says it’s an easy walk from the andrew station T stop. i was coming from harvard, so i was like, cool, easy enough. WRONG. NOT EASY. & this was in august. i’d hate to make that walk in february.